As an artist, René Romero Schuler spends her days bearing witness to the movement, spirit, and colors that are released when seeking self-truth. Having a life riddled with abuse, abandonment, and deceit, Schuler has had the ground pulled out from under her on many occasions. Trust, security, self-confidence, and inner-strength have quite literally been beaten out of her. In her upcoming exhibition In Search of Ground at Zolla Lieberman Gallery in Chicago, Schuler expresses her reflections of life’s innumerable challenges, alongside the continual effort to keep one’s feet planted, and maintain some sense of grounding. Deep texture, multiple layers, and enigmatic figures convey an emotional and mentally exhausting exercise that moves us through the deconstruction of troubling memories of hardship and loneliness, to becoming vehicles of acceptance and strength. In this exhibition Schuler displays a mindful, creative process that transforms complexities and traumas of her past to become healing stories of peace and compassion. And although abstract, raw beauty of truth is captured in the work, ultimately producing that forward-directed energy, called hope. Unlike most, Schuler never had the aimless adolescent period of trying to “figure it all out.” She knew she was an artist at four years old. She was first impacted by art and recognized its power as an alternative language of compassion, when her kindergarten teacher enthusiastically expressed joy from Schuler’s “colors on paper.” She vowed to become a successful artist at that moment. An endeavor she further confirmed, in detail, in a letter to her parents when just six years old. At 14, Schuler left her dysfunctional home life, surviving from no more than the scraps off her back. 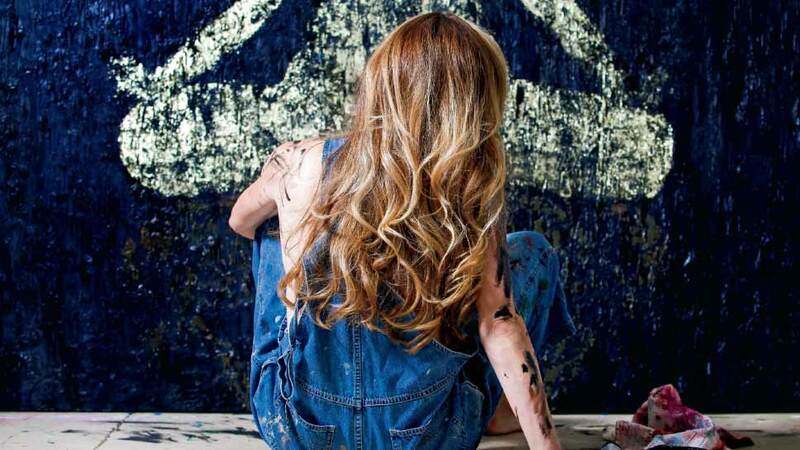 Knowing painting was her skill, and needing to pay for her livelihood, she sold her first work while still in high school, ultimately beginning a career creating commissioned art for local businesses, nightclubs, backdrops, murals, and restaurants. With her natural attributes and innate resilience for something greater, Schuler incorporated her first business in 1992, Romero Design, and opened her own showroom and gallery in 1997. Today, Schuler’s paintings have a worldwide audience and extensive collector base, that includes notable museum, public, and private collections. Here in Chicago, every show has hosted to standing room only crowds, and sold out shows for the last five years. Although art is her source of income, she has channeled her feelings through multiple mediums throughout her life, beginning with poetry and writing. During high school she found liberation and freedom in painting when introduced to the expressive works of Jackson Pollock, Frank Stella, and Gerhard Richter. She hung her canvases on curtain rods in her apartment to experiment with throwing paint, sand, glue, anything that would stick. A cathartic process, but admittedly was not going anywhere. Later, works became hyper-controlled and realistic, more in line with the works of her favorite, René Magritte, but were so technique and process-oriented she never felt finished and was left disconnected; thus, no catharsis. It was through this frustration that Schuler accidently stumbled upon her present technique, and her fine art career path. While cleaning her palette, and in a bad mood, she scraped and wiped excess paint on a nearby canvas, then walked out of the studio. When she returned the next day, Schuler saw a face in the canvas. Literally, coming face to face with the vision, she stood in front of the painting and worked through it, pulling it, and adding textures and feelings that moved through her. Stepping back, she was overcome—the painting was complete, there was nothing left to do, nothing left to give. The realization was so profound, so honest, that she wept. It is this form and reflective process that Schuler found the ability to readily connect and tell her stories. She made an additional 39 “stories” that year, abstract self-portraits, that changed the course of her career. When examining her past Schuler is forced to unravel terrible details of her difficult childhood, times of feeling suicidal, and becoming homeless, all before she could legally drive. Or even more recently, when she discovered that the man she thought was her father, was in fact, not her father. A piece of information that ultimately made her entire family abandon her, losing everyone, in her adult life. And again, brought to a deep place of grief and reflection, when her younger sister took her own life. René Schuler in her studio. In partial view is Schuler’s Dharma 2018 oil on canvas. Dharma will appear in Schuler’s In Search of Ground exhibit at Zolla Lieberman Gallery in September. It would be easier to avoid, to find distraction, or get caught up in routine, or relish in being a mother and wife for 17 years, or think a beautiful life on the North Shore is enough, that this is success. Yet the drive behind Schuler’s work mirrors her approach to navigating life: probing beyond the surface to uncover, to focus on the natural beauty, the good, that we all possess, to share the outcome of beauty, strength, and hope. To heal, she moves through memories, connects to colors and energy, creating loose, ethereal, abstracted interpretations of the human form, thus making memories become a fluid vehicle that ultimately allows her to tell her story, and then move on. Schuler’s ability to investigate and pay court to memories, and to decipher conscience, fears, and desires through creation, is what truly sets her apart. These are the things that expose her artistic strength, and how she connects story to surface. Her ability to deconstruct within creation, submit to her process, and celebrate, despite her own flaws or “baggage” is the most powerful aspect of her work. It’s the passion that goes into each piece, the raw exposure of her heart and soul that intends to highlight the idea that we are all truly spiritual beings, and our stories are what connect us. Opening Friday, September 7th, In Search of Ground presents a series of works that explore aspects of vulnerability and loneliness, but end with hope. Schuler is a true storyteller; a vigorous channeler of energy; her own, as well as those of all beings she encounters. Amazing story of hope and creativity!